At sunset, the sky over the Frenchman River Valley in Grasslands National Park in Saskatchewan is aglow in bright yellow hues. A brilliant yellow glow illuminates the sky at sunset over the Frenchman River Valley in the West Block of Grasslands National Park, Saskatchewan. The green vegetation flourishes near the river as the rolling hills rise above the landscape catching the last glimpse of sunlight. In the West Block of Grasslands National Park, there are five hiking routes where different lookouts are spectacular spots to watch a sunset. The trails are not marked very well, so it is best to venture on these expeditions with a field guide. 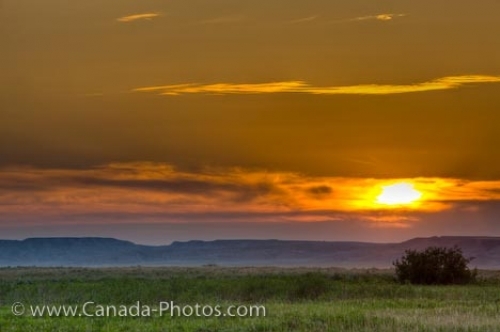 Sunset over the landscape of the Frenchman River Valley in the West Block of Grasslands National Park, Saskatchewan, Canada. Picture of a yellow sunset over the rolling hills in the Frenchman River Valley in Grasslands National Park, Saskatchewan.